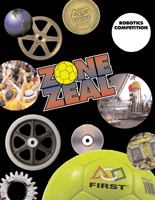 The ZONE ZEAL competition is composed of two phases: Qualification Matches and Elimination Matches. All matches are two minutes each. 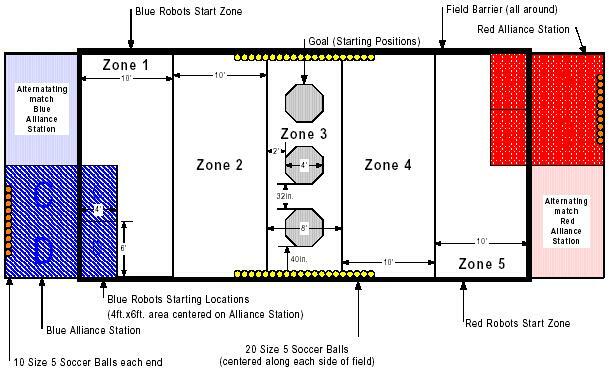 In each match, two teams work together as an alliance against another 2-team alliance to collect and score balls into goals as well as position the goals and robots on the field. During qualification matches, randomly assigned teams are partnered to form alliances. Alliances last only for the duration of a match. At Regional events, teams may be randomly allied with any other team at the event. At The Championship Event, each team is assigned to one of four divisions and participates only with other teams in the same division. Teams are ranked based on an equal number of qualification matches. Following the conclusion of the qualification matches, the top ranked teams form alliances and go on to compete in the elimination matches. Alliances formed for the elimination matches stay together for the remainder of the event. Each alliance is composed of three teams. One of the teams serves as an alternate in each match. Each team must compete in at least one elimination match in each series (quarterfinals, semi-finals, and finals) unless a team�s robot is unable to move along the carpet under its own power. Each series is best 2 out of 3. At Regional events, eight (8) alliances compete in a series of elimination matches until one alliance is declared the event champion. At The Championship Event, thirty-two (32) alliances (8 per Division) compete in a series of elimination matches, resulting in four Division Champion alliances and one Grand Champion alliance. Placing balls into goals and positioning robots and/or goals in the scoring zones at the end of the match. Each alliance is comprised of two teams with each team having three students and one mentor. Each team competes using one team-built robot. There are sixty (60) size 5 soccer balls. There are three (3) goals with castered wheels around the bases that may be moved around the playing field. All goals start equally spaced across the center of the playing field. The playing field is broken up into 5 zones. The robots must compete within the bounds of the playing field while the students are located at stations just outside the playing field. Only students may return balls from the Alliance station to the playing field. At the start of each match, each alliance station contains ten (10) orange soccer balls. Twenty (20) yellow soccer balls will be centered along each side of the playing field. All balls may be used to score points. During the qualification matches, all teams accumulate Qualification Points (QPs) that will later be used to help rank the teams. For a given match, each team in the winning alliance receives triple the match score of the losing alliance in QPs. Each team in the losing alliance receives their match score in QPs. At the conclusion of the qualification matches, each team drops its lowest QP score and the teams are then ranked according to total QPs accumulated. 39 Teams (.pdf, 9KB) attended the 2002 SBLPI LI Regional. 290 Teams (.pdf, 485KB) participated in the 2002 FIRST season at the Epcot Championship. 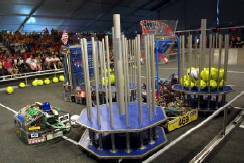 642 Teams (.pdf, 212KB) participated in the 2002 FIRST season at 17 Regional events.